Software for multicomponent dosage with various scales, for CPWE and 3590EXT indicators. Management of the dosage on various scales (up to 4 independent), with automatic scale change during the dosage. Check of the tare presence at dosage start with tare values programmable for each recipe. Storage and printing of the consumptions. Quick recall of the printouts from keyboard. Programmable number of repetitions of the dosage cycle; function of continuous cycle. Tolerance test on the dosed weight, with guided correction through simple messages on the display. Alarm management on the display. Database of 100 products/activities, which may be selected from the following. - Automatic dosage in loading. - Manual dosage in loading, with possibility of managing the control light. - Complete or partial unloading. - Fractioned unloading, for dividing all the dosed material in equal quantities. - Timer, to activate the mixers, burners, or stirrers for a preestablished time. - Pause, to allow the manual operations of the user. - Manual weight, to add the pre-weighed quantities to the dosage. Database of 500 formulas; each formula contains 20 products/activities. Programming of the activities and the recipes in manual mode or through software on PC (Dinitools). Formula selection through external inputs. Dual dosage speed (approximate and fine), managed through any available contacts or analogue output (optional). "Fine" dosage contact active either constantly or intermittently (jogging). Management of the material levels through "under minimum level" and "over maximum level" contacts. Inputs and outputs with programmable functions. Analogue output (optional) proportional to the weight or to the dosage speed. 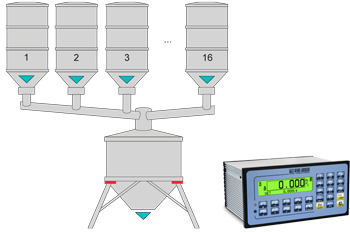 BATCH Software for multicomponent dosage systems in loading and unloading. TAKE NOTE: For 3590, only with IOEXPB optional board.